The day before Easter we pulled the taps from the maple trees, washed the cans we collected sap in and the pans in which we boiled it. We stacked the split fire wood neatly and covered it. We’d boiled off the last syrup earlier in the week and the sap hadn’t run since then. Even though we’d only finished 50 quarts of syrup compared to 200 quarts last year, it felt like time to close the sugarbush for the year. We’d heard the spring peepers croaking in the swamps and the sand hill cranes flew across the sky. 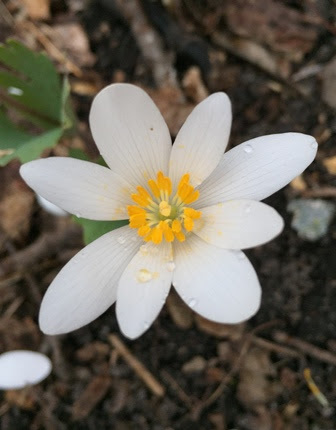 Saturday, we found bloodroot in bloom, a sure sign that sugarbush was over. Every year the blood root bloom as we dismantle our syruping operation. Our instincts had been right. Monday morning, I walked out of the barn in the pouring rain to feed Simone and let the chickens out of the pen for the day. 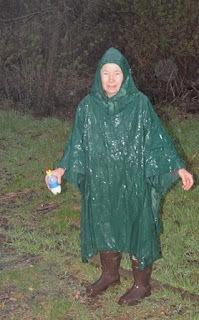 Simone’s instincts told her that the square shape in the musty smelling green flapping poncho should not be trusted. She recognized the bottle and my voice, but I looked wrong and smelled wrong. She wasn’t about to get close enough to nurse. I took off the poncho to feed her. The next day Newton and I walked the hayfield through the still damp grasses. He darted from side to side, nose busy following fresh scents – deer, fox, gopher. Suddenly he stopped, threw himself to the ground and wriggled ecstatically. I can’t begin to imagine what instinct causes a dog to roll himself in poop, but it sure stunk.